All-righty K.I.S.S. 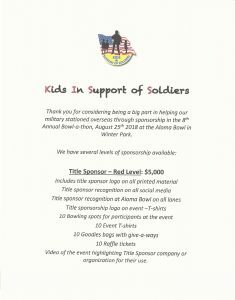 supporters, time to grab your shoes and your…round rolling devices and join us for the 8th Annual Kids In Support of Soldiers Bowl-a-thon. Saturday August 25th from 2:00pm – 5:00pm at the Aloma Bowl in Winter Park. 3 hours of bowling, shoes, event t-shirt(if paid in advance) and a raffle ticket, all for $25 per person…WOW, what a deal!! Come on out and knock down a few and support the troops, and while you are at it do some bowling. 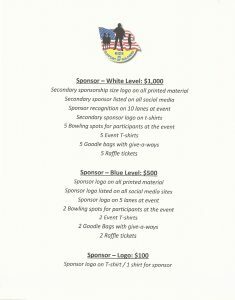 You can go to www.kidsinsupportofsoldiers.org, go to “Contact Us”, fill in the information, click on “Event Information” in the Subject line and put the names and t-shirt sizes of the participants. You can pay by check or by going through the Donate button at the bottom of the page. Payment can be made the day of event but we will still need names of all participants. Also, t-shirts are not guaranteed unless paid in advance. If you have any questions, please feel free to ask via Facebook or through the website.